4J Studios is currently working on next-gen versions of Minecraft for PlayStation 4 and Xbox One. The game was recently released on PlayStation 3 and is also available on several other platforms. After posting an image of Minecraft Xbox One, the developer has now posted an Image of Minecraft: PlayStation 4 Edition displayed next to PlayStation 3 version of the game. Next-gen Minecraft is currently in development. Previously, 4J Studios tweeted an image of Xbox One version of Minecraft, the image also had a TV displaying the Xbox 360 Minecraft “TU 14″. Now 4J Studios has tweeted an image which shows Minecraft: PlayStation 4 Edition. The developer has also displayed PlayStation 3 version of the game for comparison purposes. 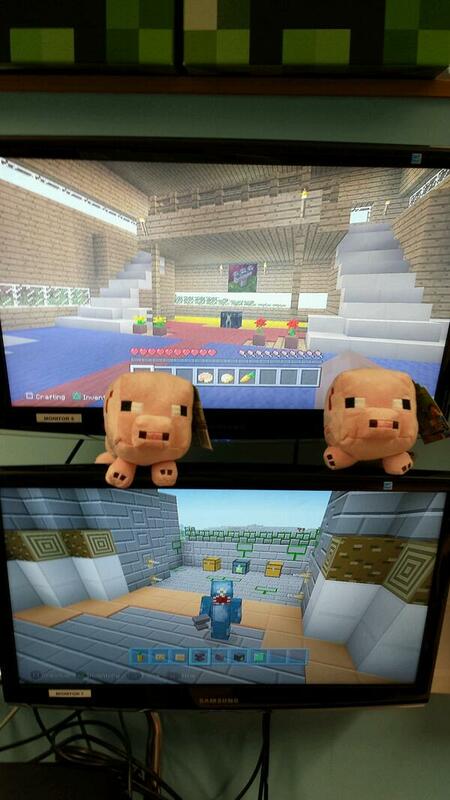 The image tweeted by 4J Studios contains two TV screens, one displaying the Minecraft: PlayStation 4 Edition and the other displaying PlayStation 3 version of the game, in-game scene is different on both the displays but still the image can be used to compare PlayStation 4 and PlayStation 3 versions.”Look at these lovely baby Pig plushies! ;),” tweeted 4J Studios, along with the following image. 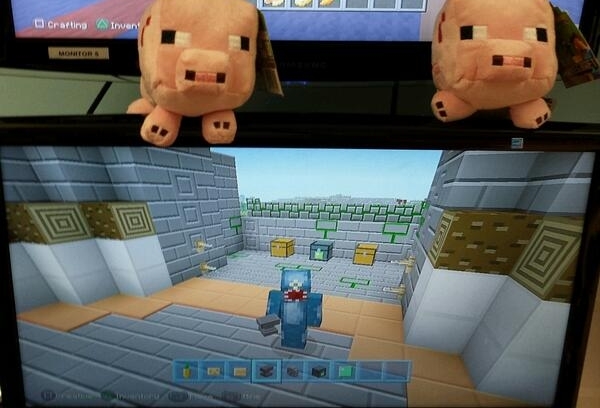 In reply to a fan, 4J Studios confirmed that the bottom screen, on top of which the “Pig plushies” are sitting, is displaying the PlayStation 3 version of the game while the top screen is displaying Minecraft: PlayStation 4 Edition. Minecraft will be released on both PlayStation 4 and Xbox One consoles later this year. The Title Update 14 for current-gen Minecraft is also in development and will be released along or before the next-gen Minecraft. The game is already out for PlayStation 3 and can be downloaded via PlayStation Store as a digital download. The game is performing very well on the other platforms, players bought one million copies of PlayStation 3 version of the game in the first month of its release. More than 14 million copies of PC version and 11 million copies of Xbox 360 version of the game have been sold until now.